There’s just something about fall that signals the beginning of all the holiday decorating and festivities and I just can’t contain my excitement. There are points in life that signal a move into adulthood and one of those points happens when you actually start buying decorations for your home with the intent to use them over and over every year. In my 20’s, it was all about do-it-yourself on a dime, since I found zero interest in spending money on home decor and I sure wasn’t going to give up valuable closet space to store anything that wasn’t shoes. Now, I want to find quality, sophisticated decorations that reflect my personal style… but still, on a budget! With that as my motivation, I was excited to partner with Pier 1 to showcase a few of their pieces and how to style them in your home. It really is a great one stop shop for all harvest and Thanksgiving needs, providing everything from home décor that reflects current trends to tablespace pieces that honor all things autumn - pumpkins, falling leaves, weathered woods and cozy knits. In my opinion, there’s nothing more iconic to seasonal decorating than a fireplace mantle. It can easily change with the seasons and your personal design aesthetics. So, the mantel is the place I’d always suggest starting first. Since my only free time seems to occur during naps, it did take me a few days and multiple scenarios to make it to this final look, but alas, it worked out better than I had envisioned. This will come as no shock to anyone who knows me or has taken one glimpse at my Instagram… but I’m not one for a lot of loud color. I really wanted something festive on a neutral color palette with bits of metallic mixed in. My first order of business is to always find the greenery. I can never have enough greenery. Since I can’t remember to water anything, I stick to the main pieces being artificial and then sprinkle in some real stems here and there in large vases. Pier 1 had an amazing assortment at affordable price points along with these cool cement utensil crocks and glass decanters that I used as a vase. Artificial flowers and plants are surprisingly expensive even when they look overly plastic, so it was refreshing to see these realistic beauties for much cheaper. I start by criss crossing them in the middle and then mix in the gold accent pieces on each side. Same motto goes for white pumpkins as it does for the greenery… more is more is more. I’m addicted to white pumpkins. Plus, they are so easy to paint if you can only find orange ones nearby. Just the vision of a pillow in a basket makes me want to curl up next to a crackling fire and read a book. So, I made sure to create just that look as well! If you could only touch those pillows in real life.. insanely soft! They round out the fireplace and help balance the overall look. 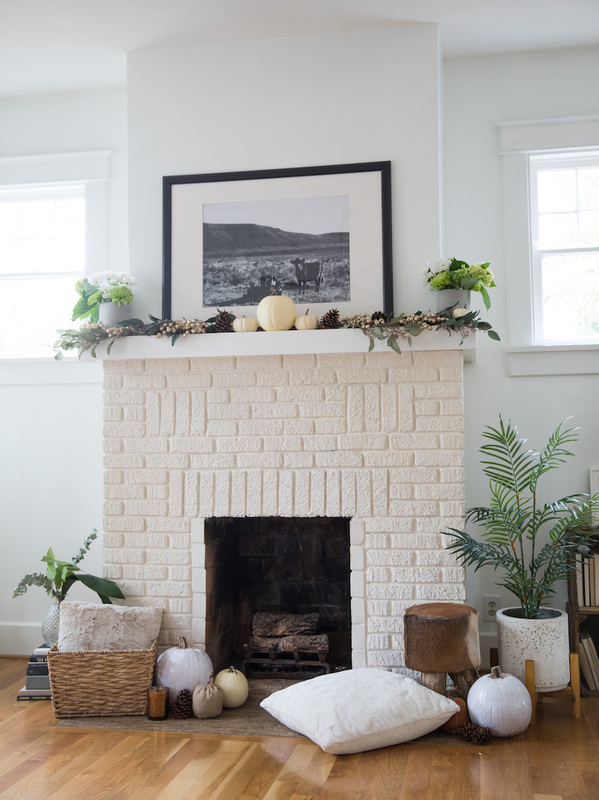 The finished product should always help elevate your mantle to being the true focal point of the room! What are some of the ways you incorporate and mix up your mantel decor? I’d love to learn and see your favorite examples!